It is not surprising that Mohamed Nasheed said people are betrothed to MDP; Male’ is like a bride waiting for a groom. 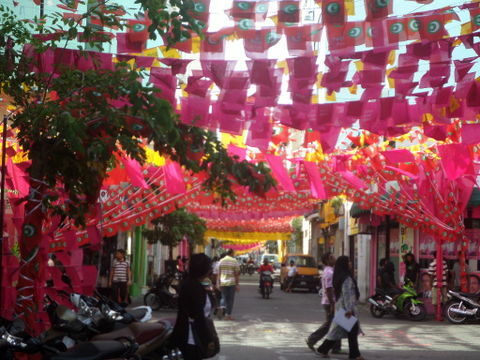 There is colour everywhere, music at every street corner and anticipation fills the air. But MDP is not the only fiancée hoping to get married on 7 September. 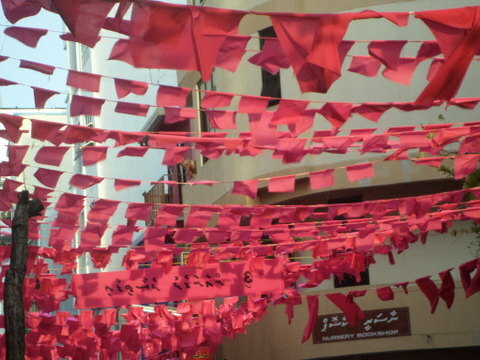 Many have committed to either PPM, JP or Waheedh, and all are hoping it would be their wedding on Saturday. The nature of each of the four couple’s relationship is different, and their resulting unions will reflect the differences. MDP’s will be a marriage of love—its members adore the party and their candidate so much, many on the outside accuse it of being a cult. Going to an event attended by Nasheed is like going to a Justin Beiber or West Life concert, complete with delirious fans wielding smart phones and iPads ready to snap and share before the man can say ‘Assalaam Alaikum’. Between 7 February 2012 and now, Nasheed must have become the most photographed person in Maldivian history. Such infatuation would be hard to maintain, and, as with all passionate affairs linking heart to heart, there is bound to be conflict. Like Barack Obama after the 2008 campaign that brought out adoring fans with great expectations that Obama simply could not live up to, Nasheed’s followers could easily find themselves disappointed by one unrealistic expectation or another. 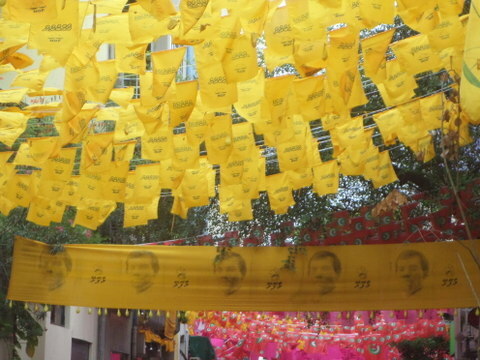 MDP’s manifesto maybe budgeted and costed, and it may have led the biggest grassroots campaign the country has ever seen, but the fact is, the dregs of dictatorship that so obstructed MDP’s first term will remain even if Nasheed wins the election. A Haveeru poll showed recently that an independent judiciary is the main concern for most voters—and judicial reform is a Herculean task which MDP failed at the last time around. The opposition’s use of religion as a political tool will also remain, another mammoth task for MDP to tackle. Fighting corruption would be just as difficult, especially considering the number of corrupt MPs and other key political figures in MDP itself. We can expect a passionate relationship with plenty of ups and downs which, if it survives the initial difficulties, can leave a legacy built on shared values and principles that can last for generations. There’s little love lost between the couples in the other three potential marriages. If any of them do happen, they would all be marriages of convenience, pragmatic unions that serve particular interests. 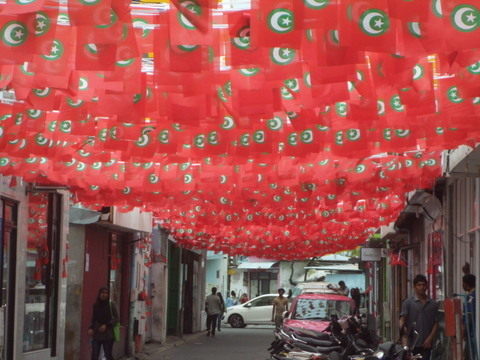 Qasim Ibrahim’s campaign has been defined by money—the giving and taking of it. This would be a relationship based entirely on finances—Qasim will have to keep giving, and his betrothed will keep expecting more. Qasim would demand absolute obedience in return for the laptops, the school equipment, the ‘philanthropy’ of student loans, and the mountains of cash spent on campaigning. 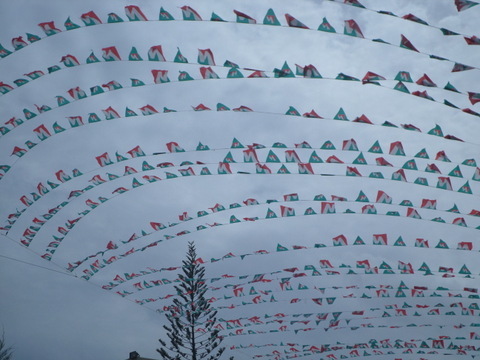 Qasim has promised to ‘leave the treasury alone’, and to stop corruption. But his manifesto suggests there will be a lot of ‘facilitation’ of his own interests through the (ab)use of law. A key JP pledge is, for example, to provide easy low interest loans to complete unfinished resorts. Gasim has over ten of them. It is also very unlikely that Qasim will do anything to reform the judiciary. He thought UN Special Rapporteur on Independence of Judges and Lawyers Gabriela Knaul’s report was a joke, fought hard to keep fornicating judge Ali Hameed on the Supreme Court bench, and did not leave the JSC until forced to do so after becoming a presidential candidate. It is hard to say that Qasim’s voters will be disappointed by any of these potential failings—as their prime interest in Qasim is his money. This is a marriage that can survive for as long as Qasim, as Sugar Daddy, can keep the cash coming. Without it, the relationship would not survive months let alone years. Qasim’s only other hope is to use Adhaalath to enforce strict Sharia, and make the bride a slave to his whims through the (ab)use of religion. Beatings are allowed. There’s not much to say about Mohamed Waheed—it is the marriage most unlikely to occur for the simple reason that nobody seems to believe he is husband material. Unlike Gasim he has no money to give, unlike Nasheed he has no love to receive, and unlike Yameen he has no powerful family to back him. Waheed’s only hope is a forced marriage where stronger external forces—-such as international or military/police support—would maneouver the bride to accept his hand, no matter what the consequences maybe for her. If the marriage does happen, it will be a shotgun wedding that will end prematurely in disaster for both sides. Yameen Gayoom’s betrothal is an arranged marriage, planned to the last detail by his family. The fiancée feels an infinite loyalty to the family patriarch Gayoom, and cannot say no to the arrangement no matter how unattractive the prospects. The Gayoom family has tried to persuade the bride-to-be that what comes across as arrogance in Yameen is actually a deep disguise to hide how ‘seriously funny’ the man is. This a marriage in which there will not be much warmth and a lot of time spent waiting for oil. It may last, for the ties of loyalty and patronage are strong. But they will remain binding for only as long as the family patriarch remains. Despite being a ‘hundred percent Muslim country’, there can only be one bride at this particular wedding on 7 September. Each will impact our present and shape our future. Choose your groom wisely.